Are you staying in a hotel near London Bridge or visiting the City? Hotels.com have asked me to share my recommendations for a day out in the London Bridge area. The spending money was gifted by Hotels.com, but all views are my own. Scroll down to see what you can get up to in and around London Bridge. When I moved to London 5 years ago I was keen to make sure that I never took the city for granted. They say if you’re bored of London you’re bored of life and I think that has to be true. One of my favourite things is to spend a whole day exploring just one particular neighbourhood. We spend a lot of our time in North London whether its Crouch End, Alexandra Palace or Enfield, so when we decide to spend a weekend in the city we often try to venture south of the river. 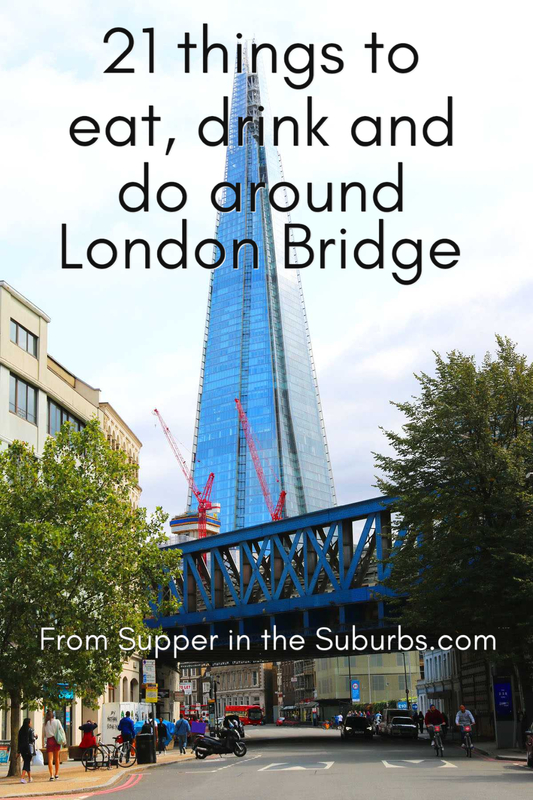 When Hotels.com got in touch to ask me if I would share some suggestions for things to do in and around London Bridge I merrily agreed. London Bridge is just a short walk from my old office and I’ve spent hours and hours strolling through the streets, drinking in the pubs, and sampling the delights at Borough market. So, you can be sure this guide is well trodden, tried and tested! Whether you’re staying around London Bridge as a one off, or if you work in the City, then this guide to London Bridge is for you. If you’re spending the day exploring London Bridge you’re going to want to start with some coffee. If you only visit one coffee shop make sure its the Monmouth Coffee Company. At the London Bridge flagship store they roast coffee from single farms, estates and cooperatives. But be warned its SERIOUSLY popular so you’ll have to wait in line to get your caffeine fix. Although it is more well known for its coffee and cocktails, London Grind isn’t a bad shout if you’re looking for breakfast, brunch or lunch. You’ll find all the classics on the menu (like avocado on toast and buttermilk pancakes and eggs florentine). If you’re after something healthy I highly recommend the porridge topped with peach and pistachio. There’s also plenty for vegetarians and those avoiding dairy and gluten. Borough Market is an absolute must visit when you’re in the London Bridge area. It is arguably London’s best food market and is therefore teaming with visitors all year round. From tempting truffles to golden bee pollen, garlic mayo laden shawarma to sweet and spicy chorizo roll, Borough Market has gourmet goodies to suit every palate. Go hungry and make the most of all of the free samples. No trip to London Bridge is complete without stopping of at Konditor & Cook. I used to visit this German bakery every Friday while I worked just a few minutes’ walk away. Needless to say I got rather round rather quickly! I highly recommend anyone of their brownies and their famous Curly Whirly Cake! If you’re not too full from all the free samples then make sure you grab a chorizo roll from the grill outside the Brindisa shop, just outside of Borough market. Head inside and you will find a treasure trove of Spanish ingredients. It’s a food lover’s dream! You might be seeing a theme here…Bread Ahead can also be found in Borough Market. Sure you could pick up a loaf of bread lovingly baked by one of their expert bakers, but if you have time I’d highly recommend attending one of their baking courses. You can learn all sorts from how to enrich dough, how to perfect the New York bagel and pretzel, you can even learn how to make fresh doughnuts at home! I’m booked on to the Christmas baking workshop in December. See you there? If you’re going to be in and around London Bridge at dinner time then get yourself a booking at Hutong. There are a couple of restaurants in the Shard but Hutong is my absolute favourite. They serve their signature dim sum and classic Northern Chinese dishes. I once made the mistake of ordering an entire cauldron of Sichuan chilli dusted soft-shell crab just for myself…I made a good dent in it but was sadly defeated (look for the “Red Lantern” on the menu). When we visited last weekend I was much more sensible and ordered just a few dishes. The black truffle and shiitake mushroom buns and the Ma La chilli prawns, fried with dried chilli, Sichuan pepper and Chinese celery (pictured) were the real highlights! If, like me, you have a vegetarian in tow then don’t worry there are plenty of dishes for them to choose from and they won’t go home hungry. The Golden Hinde is an English galleon, known for her famous captain (Sir Francis Drake) who used her to circumnavigate the globe between 1577 and 1580. For just £3 you can step aboard the vessel and explore. The Menier Chocolate Factory is one of London Bridge’s best kept secrets. It’s a 180-seat theatre which also boasts a restaurant, bar and rehearsal rooms. Unsurprisingly it gets its name from the old chocolate factory which stood on the same site until the late 1800s. Here you’ll find all sorts of exciting fringe performances from plays to musicals, live music and stand up! It’s all about boats down at London Bridge. If you’re been to see the Golden Hinde then why not visit HMS Belfast for some more nautical themed fun! The Second World War Royal Navy Warship was built in 1938 and spent 33 days at Normandy firing over 5,000 shells. You’ll be pleased to know its fighting days are over and its now a museum run by the Imperial War Museum. So jump aboard to find out about life for the crew at war and at sea. For my creative readers, head to London Glassblowing to see some absolutely mesmerising works of art all made out of colourful glass. Time it right and you can see glassblowing in action (though the artists stop around 1-2pm for lunch and are usually finished by 4:30pm. If it’s Bavarian bier you’re into then you need to head to Katzenjammers! I know, beer halls aren’t usually well known for the quality of their beer but at Katzenjammers you’ll find at least 9 on draught and more than 20 in bottles. If you want to branch out a little they also have guest beers which rotate with the seasons. OK, so maybe its cheating including a shop that’s owned by the same people who own The Rake but hear me out… this bottle shop in Borough Market has a fantastic range of craft beers for you to take away. If you’re into craft beer you have to stop off at Utobeer! If you’re a true craft beer geek then you won’t be able to spend a day in the London Bridge area without making the 7 minute walk to the top of the Bermondsey Beer Mile. From here you’ll find the mile long strip of breweries, taprooms and pubs which make this road famous! I asked Jon (@beerinthesuburbs) to pick his favourites and God did it take ages…after 20 minutes of deep thought he recommended Brew By Numbers, The Bottle Shop and Anspach & Hobday. Enjoy a yoga class with a view with Yogasphere. There are a variety of classes to choose from, all offering an opportunity to work mind, body and soul while peering out across the London skyline. I highly recommend opting for the sunrise yoga class at 7am on a Monday! It’s the perfect way to start your week. Altogether now, “Ommmmmmmmmmmm”. Want to escape the skyscrapers and find an oasis of calm? Hop over London Bridge and on the north side of the river you’ll find an old ruined church (St Dunstan in the East) that has been taken over by palms, ferns and other foliage. It’s the perfect place to sit back, relax and contemplate the meaning of life. If you’re in need of some pampering then head to The Stress Exchange for a wide range of treatments including facials, manicures/pedicures and the Aveda Stress Fix Body treatment which is proven to reduce feelings of stress! It can sometimes feel like green space is hard to come by in the City. But just a few minutes’ walk from London Bridge station and you will find Potters Fields Park. You’d almost be forgiven for thinking you were in the countryside with its sweeping expanse of grass, dappled with sunlight passing through the trees and wildflowers scattered throughout the beds, if it wasn’t for the view of Tower Bridge, the Gherkin and City Hall! Head downstairs to an old Victorian basement and be transported into the tropical, vintage paradise that is Nine Lives Bar. “Sustainable” is the theme of this bar as they aim to reuse and recycle: whether it’s the sourcing of equipment and furniture or the composting of all of the food and drink leftover at the end of the night, nothing is wasted. If you’re visiting on a Saturday be sure to stick about for one of their weekly parties which go on until “late”. If you’re looking for a local hangout, things don’t get more local than The Hide Bar. Almost all of the drinks served are distilled, brewed, fermented or produced in London so you don’t have to worry about your carbon footprint here! Some of the cocktails even have London themed names – why not order a Bermondsey, or perhaps a Peckham + Rye? The drinks list is long enough to keep you going until close in the wee hours of the morning. So, there we have it. You’ve reached the end of the list! Did I miss anything off? Where are your favourite places to hand out when you’re in the London Bridge neighbourhood? Awww yay glad you enjoyed it Lisa. If you’re ever back I’m full of suggestions for fun places to visit! There are such a wide wonderful variety of eateries in London – I reckon you could live your whole life there and not try them all out! What a super guide, this! LOVE this post! The last couple of time’s we’ve stayed in London its been in this area. Monmoth coffee is a must – well woth the queue. Borough Market is the reason we stay where we do. Havent made it to London Grind yet but its on the list. I’d add The BreakFast club for eats and The Globe and the Fashion and Textile Museum for culture. I’m glad there is some inspiration on the list for your next visit. You’ve made some great suggestions too!